One of my favorite applications was improved today when iSlayer released iStat menus version 1.3, a free utility for OS X. If you haven’t already downloaded and installed it I can’t recommend it enough. It’s a great tool for monitoring the health of your Mac and I’ve used it as a quick-glance diagnostic tool whenever I want to see if something’s amiss. There are also a number of bug fixes and additional minor features in this release. 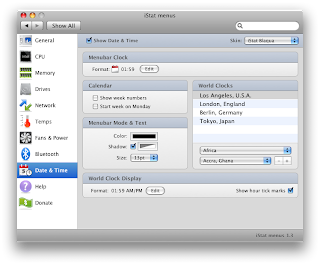 If you aren’t using iStat menu then by all means, click here, download it and install it. 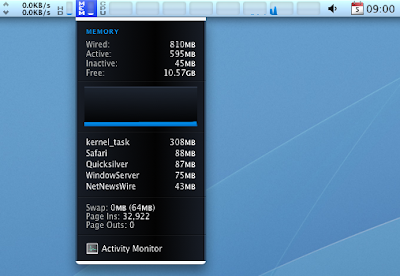 While you’re at it you may want to look at their Dashboard widget as well: iStat Pro. Between the two I can see at a glance what is going on by looking up at my menu bar, click on it to dive in a little deeper, launch Activity Monitor from it if I see something I’m curious about or simply open my dashboard and get a comprehensive view of the health of my machine. Like iStat menu as much as I do? Consider donating to these guys. It’s money well spent and rewards some people for creating a really valuable utility.